The province of Muğla, located in the southwest corner of Turkey where the Aegean Sea meets the Mediterranean, includes popular holiday destinations, such as Gökova, Bodrum, Marmaris, Datça, Milas, Dalyan and Fethiye. With its beautiful resorts, impressive ruins of past civilizations, magnificent landscapes and vast beaches, thermal waters, rich flora and fauna, as well as accommodations, restaurants and entertainment choices to suit every taste, this region has something to offer to everyone. The Muğla region, called ‘Caria’ in ancient times, has been a leading social cultural, and historical centre for centuries. The first known inhabitants of the region between the Dalaman and Meander rivers were ‘Carians,’ existing as early as 2000 BCE. Since then, numerous ancient societies and Anatolian civilisations, including Greek, Roman, Byzantine, Seljuk, and Ottoman peoples, have existed here. The region came under the rule of the Ottomans in 1390, starting the era of Turkish sovereignty in Muğla. Muğla, the province’s capital, is a charming city that stretches from the foothills of Asar Mountain onto the plain bearing its name. Muğla, a peaceful and modern city, has a low population growth rate and it is famous for its unique architecture. Picturesque homes with whitewashed walls, red tiled roofs and distinctive chimneys have gained a large amount of fame and have been placed on the protected buildings list. Since the economic development of the city mostly relies on tourism, Muğla’s natural, cultural, and historical beauty have always been protected. Indeed, Muğla is a city keeping its past for its future. Muğla has several notable sites that are well worth visiting: the Muğla Museum with fossils of extinct animal species excavated in the village of Özlüce; the historic trade guild’s markets; Saburhane, where historical houses, shops and cafes offer a glimpse into the past; Kur unlu and Ulu Mosques built roughly 600 years ago; the Olive Merchants’ Building; and the Konakalt Cultural Centre. Additionally, three kilometres outside the Muğla City Centre is the region’s renowned highland summer retreat known as ‘Muğla Yaylas,’ which boasts tall trees, fruit orchards, vineyards and vegetable gardens. The city of Muğla is a hub for transportation, with coaches running directly from the otogar to neighbouring towns and major cities all over the country. The highways in Muğla are connected with those of Aydin, Denizli, Bodrum and Fethiye, linking Muğla with the rest of the country. There are two international airports in the province, Dalaman and Bodrum-Milas. Muğla Province, which accommodates nineteen marinas and slips, has the longest coast in Turkey with a total length of 1,124 kilometres. Regular boat trips are available between the coastal resorts as well as to neighbouring Greek islands. Muğla has a Mediterranean climate; it is hot and dry during summer and cool and rainy during winter. Muğla ’s residents are only an hour away from some of Turkey’s most popular tourist destinations: famous antique cities such as Halicarnassos, Knidos, Mylasa, and Kaunos; hundreds of magnificent bays with unmatchable beauty; the Blue Lagoon, the Caretta Caretta Beach, the Patara Beach, and the Butterfly Valley. The myriad of venues offered by Muğla Province make the region as attractive as it can be for the three million tourists hosted annually. Muğla is very rich regarding endemic types of vegetation. On the agricultural front, the region is famous for the production of honey, olives, olive oil, citrus fruit, almonds, various herbs, and greenhouse vegetables. 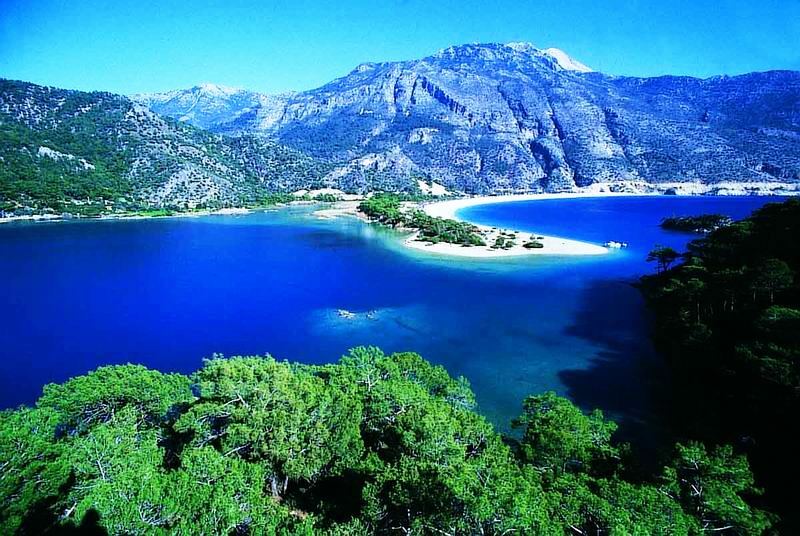 Muğla is a heaven of monumental trees and more than two-thirds of Muğla Province is covered with forests. The wildest natural beauties are within only a short distance from the city centre, giving endless possibilities for escapes to spectacular countryside. Visitors to Muğla can also engage in countless outdoor sports, including trekking, mountain climbing, hang gliding, cycling, riding, fishing, sailing, diving, and other water sports. Additionally, the lively towns of Bodrum and Marmaris have abundant nightlife venues. At the beginning of summer, the world of entertainment moves from Istanbul to the south of the country where spectacular festivals, performances, and concerts take place. Muğla Sıtkı Koçman University has been, in every sense, a leading stimulus for the development of Muğla. Thousands of university students come from other cities of Turkey with different ethnic and cultural backgrounds enhance the social structure of the city. They give the city a new multicultural, free, peaceful and Western identity. The richness of the natural beauty, the pristine waters, and the magnificent historical and cultural heritage are all represented in the emblem of the university. When the academic year starts, the city welcomes students, who dramatically change the population and appearance of the city. The blend of natural and historical resources, along with the vitality of students, is rapidly moving the city in the direction of becoming a centre for educational and cultural affairs.